John Brown's raid on Harpers Ferry was a turning point in the sectional crisis. For many in the North, Brown became a martyr to the abolitionist cause. John Brown's raid also convinced many white southerners that militant abolitionists were commited to the destruction of slavery through insurrection and that southern interests could best be protected outside the Union. The Kansas-Nebraska Act of 1854 overturned the Compromise of 1820 and mandated that the status of slavery in those two territories would be determined by the settlers themselves—a doctrine known as "popular sovereignty." Over the next year, proslavery southerners and antislavery Free-Soilers poured into Kansas. Among the Free-Soilers was abolitionist John Brown and five of his sons. In a fraudulent election, a minority of Kansans, along with a large number of "border ruffians" from Missouri, returned a proslavery majority to the territorial legislature. Violence erupted. In early 1856, proslavery forces sacked and burned a part of the free soil town of Lawrence. In retribution, on May 24, 1856 John Brown led a small party of men to the homes of proslavery settlers along Pottawatomie Creek. There, five men were dragged from their homes and brutally killed. Over the months that followed, Brown denied responsibility for Pottawatomie—a claim accepted by many abolitionists. As the conflict in Kansas expanded, he gained national recognition for his defense of the free soil town of Osawatomie. For his actions, he earned the nickname "Osawatomie Brown" or "Old Osawatomie." Over the next few years, Brown traveled through New England and the Midwest gathering support and raising money to take the fight against slavery to the South itself. What Brown envisioned was a slave uprising in Virginia. In June 1859, he arrived in Harpers Ferry, at the junction of the Potomac and Shenandoah rivers in the northern part of the state. Brown rented a farmhouse and waited for recruits to join him. Twenty-one men, twelve of whom had been with him in Kansas, eventually joined him. On 16 October 1859, Brown led eighteen followers in a raid on the federal arsenal and armory at Harpers Ferry. Brown planned to use the weapons he and his men seized from the arsenal to arm slaves and inspire a general uprising. No slaves rallied to Brown's banner, however, and the insurrection collapsed. On 18 October, a detachment of marines under Brevet Colonel Robert E. Lee attacked the engine house of the armory, which Brown and his followers occupied. Most of Brown's men were killed, and he was wounded in the attack. Captured and arrested for treason, he was found guilty and sentenced to death. On 2 December 1859, John Brown was hanged in Charlestown, Virginia. In his diary on the date of Brown's execution, William Gwathmey, a King William County planter and physician, described Brown as a "wicked beast[ly] man." His diaries entries on that and subsequent days give us a glimpse into the fear and anger of a white Virginia planter reacting to John Brown's raid. The diary entries that follow were written by William Gwathmey (1794–1875). Gwathmey's diaries are part of a larger collection (approximately 10,000 items) of family papers that date from 1790 to 1982. These papers include letters, diaries, accounts, deeds, estate materials, and related records produced by four generations of Gwathmey family members who resided at their plantation, Burlington, in King William County. William Gwathmey was a planter, physician, and trustee of the Beulah Baptist Church. His diary comprises twenty volumes that span the years from 1833 to 1874. (There are no diaries for half of those years.) Many were bound with printed copies of Richardson's Almanac. Almanacs such as Richardson's contained information for farmers, including how to use fertilizer, the dates of solar and lunar eclipses, and the optimum times for planting and harvesting. As the space allocated for individual entries was limited, farmer's diaries often contain little more than details about weather and work. Because they were intended to be referenced by the individual farmer or planter, entries are often filled with abbreviations and other forms of short-hand. Gwathmey wrote that the hanging "occurred without outbreak," revealing a fairly common fear among white southerners that attempts would be made to rescue John Brown. In the entry of 4 December Gwathmey wrote that "old Brown was in this neighborhood callg himself McLane sellg trusses." This statement also attests to the power of rumor. John Brown was never in King William County. Gwathmey's acceptance of a reported sighting of him reveals more about his fears than it does about Brown's travels. Many slaveholders held a paradoxical view of their bondsmen. On the one hand, they believed their slaves were happy, docile, and child-like; on the other, they believed they were potentially violent and vengeful. The historian Bertram Wyatt-Brown describes slave owners as possessing "two alternating states of mind—apathy and horror." When faced with the possibility of insurrection, slave owners would "forsake their usual equanimity and succumb to panic at the prospect, real or imagined, of black-led bloodbaths and the upturning of the social order." 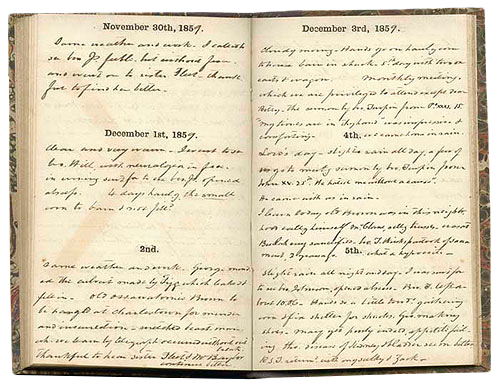 William Gwathmey's diaries primarily describe weather conditions, farming operations, physician's visits, and church activities. Only occasionally does Gwathmey make reference to state or national affairs. The fact that Gwathmey mentions him reveals the significance of John Brown to southerners. His reference to "old ossawatomie Brown" on 2 December suggests his knowledge of John Brown, his background, and the raid. While we need to be careful in our interpretation, Gwathmey's claim that Brown was selling trusses (devices worn for support) may be a way of demystifying him. By asserting Brown was nothing more than a common peddler, perhaps Gwathmey was using mockery to deal with the incomprehensible. Two biblical passages read at church by Brother Turpin, a lay preacher, are included here. Gwathmey, Turpin, and the other whites in the congregation at Beulah found solace in these words, seeing themselves as the true Christians who were being persecuted. What is important here is that John Brown, Brother Turpin, and William Gwathmey all found justification for their actions in the Bible. ful to find her better. bro. Hill with neuralgia in face. corn to barn & not filld. and insurrection – wicked beast. man. carts & wagon. Monthly meeting. Betty. The sermon by bro Turpin from PsXXXI. 15.
comforting – we came home in rain. John XV. 25. "He hated me without a cause." R.S.T. returnd with my sulky & Zack. Have your students read the diary entries. What do the abbreviations and short-hand suggest? Who was the diary written for? How do you know? Give the students a copy of the typescript and have them guess about the person who kept the diary. What did he do? What was he like? If your students don't realize the significance of what they are looking at, draw their attention to the date and have them refer to their textbooks. Discuss John Brown's career and his raid on Harpers Ferry. Discuss Gwathmey's religious faith. Is he a religious person? How do you know? Find the two passages of scripture that serve as the basis for Brother Turpin's sermons. Read the passages. Why did Turpin choose these specific readings? What does Gwathmey hear in these words? Gwathmey wrote that Brother Turpin claimed "old Brown was in this neighborhood." Point out to them that John Brown was never in King William County. Why would Brother Turpin believe the man he saw was John Brown? What does this reveal about the fears and concerns of southern slave owners? Find examples of northern reaction to John Brown. How was the Harpers Ferry raid viewed by northern Democrats? Republicans? Abolitionists? How did Henry David Thoreau view John Brown and the Harpers Ferry raid? Does this tell us more about why the specific Biblical passages were selected? In his attempt to understand the Harpers Ferry raid, William Gwathmey degrades John Brown while seeking solace in the Bible. Ask your students if they have seen others respond to crises in the same way. Paul Finkelman, ed. His Soul Goes Marching On: Responses to John Brown and the Harpers Ferry Raid. Merrill D. Peterson. John Brown: The Legend Revisited. David S. Reynolds. John Brown: Abolitionist: The Man Who Killed Slavery, Sparked the Civil War, and Seeded Civil Rights. Bertram Wyatt-Brown. Southern Honor: Ethics and Behavior in the Old South.